A small nocturnal insect (Cimex lectularius), of the family Cimicidae, that feeds on the blood of humans and other warm-blooded hosts. 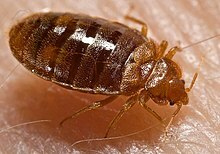 Cimicidae or (sometimes bedbugs), are small parasitic insects. The most common type is Cimex lectularius. The term usually refers to species that prefer to feed on human blood. All insects in this family live by feeding exclusively on the blood of warm-blooded animals.